nevard_100615_downes-box_DSC_7983_web, originally uploaded by nevardmedia. A couple of weeks ago I had the privilege of visiting the legendary model maker Alan Downes at his country seat in the wilds of Lincolnshire to photograph his latest top secret creation. 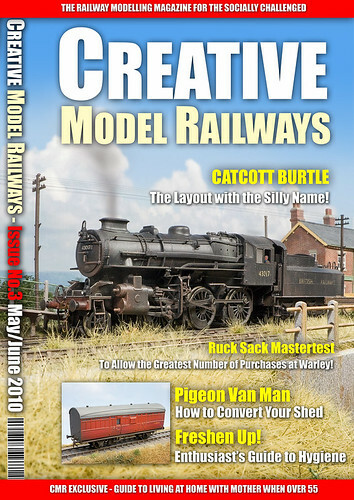 Whilst I cannot tell you any more about that, I do have to say that Alan is great company with many tales to tell of his modelling career which frequently brushed with the rich, famous and even royalty - many of who had and have model railways. Being a professional model maker, Alan has many short cuts to allow speedy progress of large structures in record time, he also dismisses fine detail, he says that you simply so not need it if you get everything else right. I bet very few admirers of his work ever notice that none of his windows are open, or that they have no curtains because everything else is so 'right'. Bath's 'Black 8' No. 48660 is captured here powering through Catcott Burtle in the late summer of 1963 with a perishables train made up mainly ex LNER stock. Note the photographer's Austin A35 Countryman parked on the concrete bridge which crosses over the remains of the old Glastonbury Canal. The crossing keeper it would appear was rather impatient to put the signal back at danger even though the rear of the train had yet to pass it. Tuesday afternoon was an ideal one to sit in the garden and head towards a completion of the Hornby 8F that's been on the workbench for a couple of weeks. 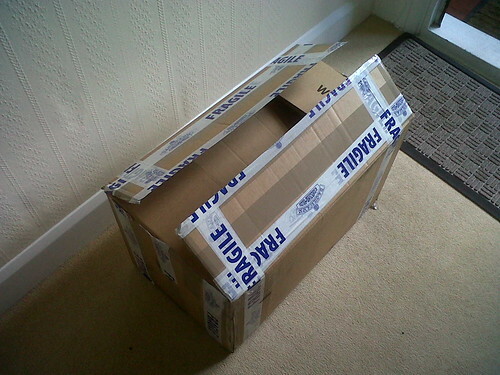 In the end I decided to abandon the Brassmasters detail kit, delivery for me was going to take far too long from ordering, and on top of the fact that they claim only to check email once a week and don't take online payments. I firmly believe that colouring is by far the most important aspect for creating realism, and the great thing about that is that you just need nothing clever, just a bit of spare time, paint and maybe some weathering powders. 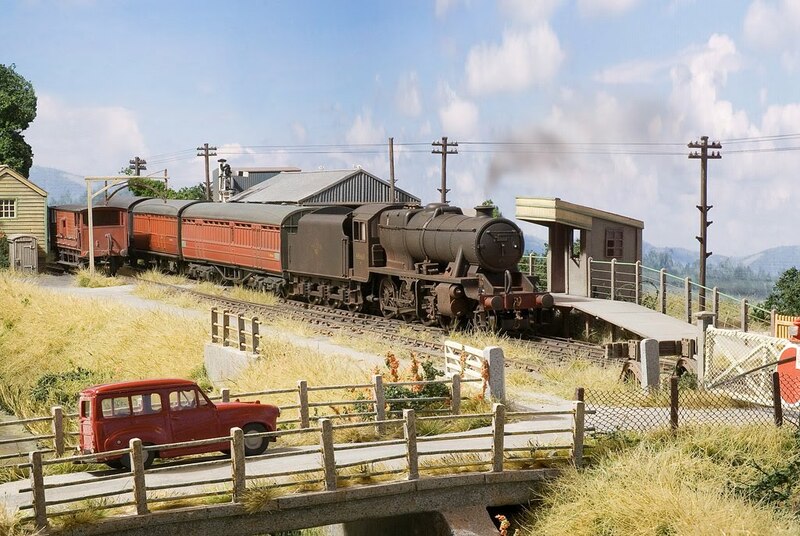 To get the result here, the new scratchbuilt brass steps were blasted with a bit of Halfords matt black, and then HMRS Pressfix tranfers were applied to the engine represent 48660 which was shedded at Bath Green Park in the early 1960's. Next; a quick blast of Railmatch matt varnish to protect the tranfers and to make a key for the weathering. This is very very simple; in one of the cat bowls I mixed up some Cuprinol satin black, water, a splat of washing up liquid and a dash of Carrs' rust coloured weathering powder. Now the scary bit, the fowl mix was sploshed all over the engine and then dabbed off with kitchen tissue. A large dry decorator's brush was then used to work the remaining paint into the groves and recesses, this being done until the mixture dries which takes about 2 minutes on a hot summer's day. Carrs rusty and pale grey coloured powders were further rubbed on with a stiff brush and then again sealed with another dusting of Railmatch Aerosol Matt Varnish. Bingo. There's is still scope for further weathering like lime streaks and so on, but now I have a good smeared Christmas Pudding type of base after seeing and touching real working steam in Poland back in the aerly 1990's first hand. Often people aim for a 'Barry Scrapyard' effect which is wrong for a working but dirty engine which should be oily and sticky rather than dusty and arrid. nevard_100613_coal-steam_DSC_7863_web, originally uploaded by nevardmedia. At last construction has started on my coal mine project with a bit of kack handed carpentry this morning moving this project on from 'arm-chair' firmly into 'cuts-and-bruises' territory. As with most of my recent projects, this one will be housed in a diorama style box with built in lighting and a curved corner-less backscene (missing here) as with Catcott Burtle, Cement Quay and Arne Wharf. The size of the module here which is being checked out by Fleur is 4ft long x 20 inches deep x 2 ft high. Why so high? 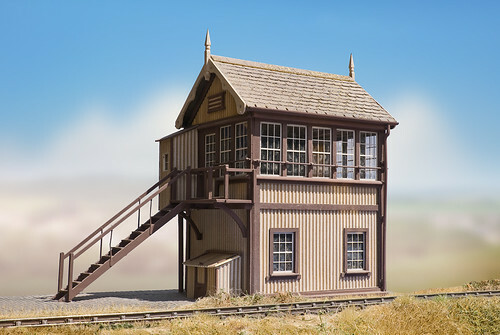 Because there'll be a chimney and I want a backdrop to be seen behind it all the way to the top as well as protecting the highest part of the layout when in storage and in transit. I've decided to use conventional materials this time too - simply because of what the previous owner of my house left in the garage and an offer on some ends of 6mm ply at B&Q. 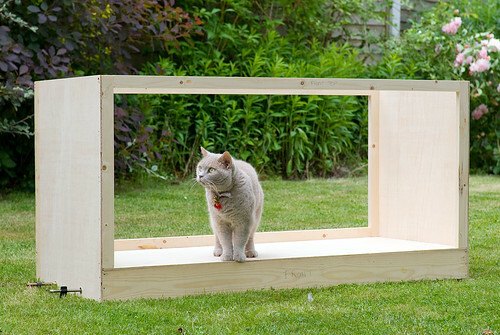 I don't need to build any fiddle yards this time for I'll be using Catcott Burtle's ones, I'll also be able to use Catcott's trestles and drapes. The trouble bit is that I have yet to get planning permission for this project - but because I won't be making extra fiddle yards, legs and so on the amount of space it will take up is marginal. nevard_100610_hornby-8f_IMG_7202_web, originally uploaded by nevardmedia. 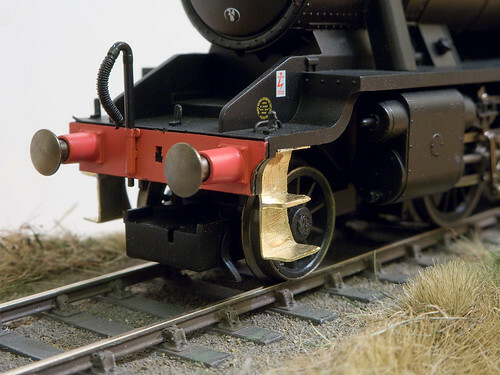 The ongoing Hornby 8F project was missing some front steps, so rather than wait what could be a whole month for Brassmasters to get their act together I decided to fabricate some new ones from brass sheet and solder using photographs and the the rear ones on the loco as a template. They may lack rivet detail, but seeing I'm not bothered by such and that they'll be covered in rust and grime these will do the job fine, they're nice and strong too! Next I'll be taking a big file to the pony truck and removing the big coupling block that won't be required.New wheels will help too! Test arrangements...., originally uploaded by nevardmedia. A little more progress with the Coal and Steam project; I had a few spare moments earlier so had a play with possible arrangements based on various prototype colliery photographs of what goes where. The joy with the real thing is that it varies enormously thankfully! I must apologise for the photo quality, it being simply grabbed on my mobile phone! 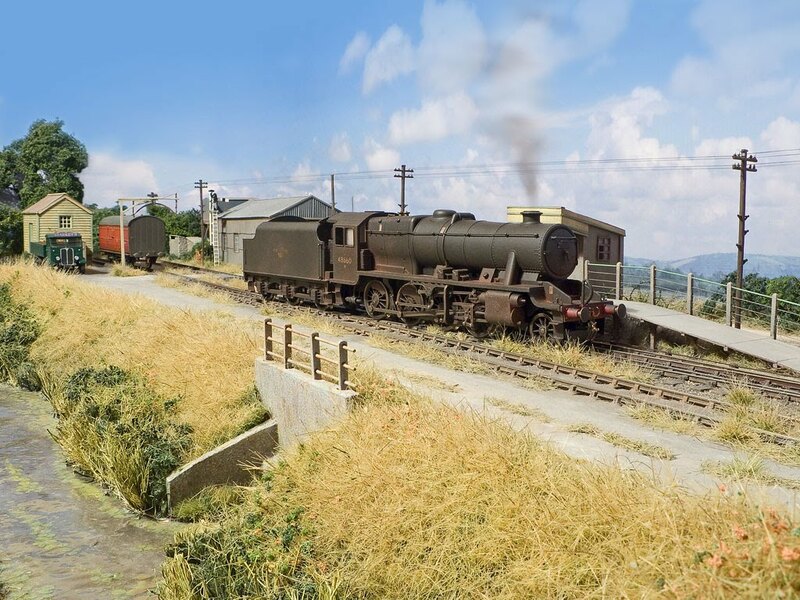 The various buildings, once selected will then be customised extensively to take on the regional look of the North Somerset area, with much of the brick being replaced with a stone veneer and the rather heavyweight slates replaced with corrugated iron. 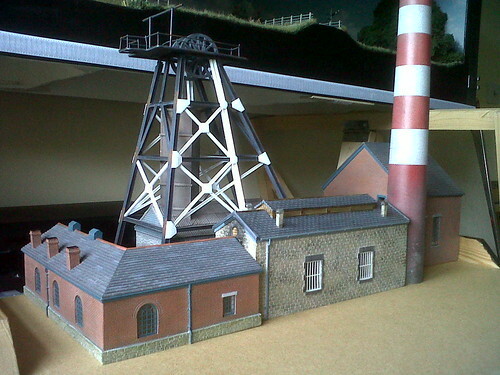 The chimney, which will be scratchbuilt in due course has simply been borrowed from Cement Quay. Loading screens not seen here will be scratchbuilt using various plastic sheets over a foamboard base. Buildings here from left to right; a Bachmann Scenecraft smithy, Skaledale pit head (with a few mods started), a Scenecraft 'stone engine shed' which will turn into a boiler house, and to the far right a Scenecraft winding house which will be stone clad and gain a corrugated roof. The layout floating in the sky above is Catcott Burtle, my little bit of the 'Somerset & Dorset' on the 'Levels'. Delivery from Bachmann..., originally uploaded by nevardmedia. I'd been promised a few Bachmann Scenecraft seconds to play around with, though I must admit it as quite a surprise to find this giant box stood in our hallway earlier this afternoon! My wife was a little concerned thinking that I'd blown what looked at least 5 years railway modelling budget on toy trains - not so I assured her! 091205_promo-03a_web, originally uploaded by nevardmedia. Let me just say that this is just a bit of silliness with Photoshop, about 20 layers and too much spare time! I also must apologise to those who don't like soap, those people who constantly whack me at shows with their rucksacks and to those who never left the nest. nevard_100602_hornby-8f_DSC_7670_web, originally uploaded by nevardmedia. After meddling about with 009 and Arne Wharf at weekend at RAILEX, I'm quite pleased to put the narrow gauge stuff away for a while. I'm sure as we get older many of us have less patience for the tiny stuff. So, as a relief on the workbench I have a second hand Hornby LMS Stanier 8F 2-8-0 which is going to be detailed up to represent one of Bath Green Park's finest which were allocated to the old S&DJR to replace the ageing S&DJR 7F 2-8-0s between 1963-1966. I'm still undecided which engine to go for, the choice being 48309, 48660, 49706 and 48760. Saying that, I'm warming toward 48660 - it appearing to be allocated to Bath the longest. This loco was sold to me recently as a half finished project for an excellent price - perfect, because it was cheap and much of the tidying up of mould lines already done. The downside was that the loco didn't run too well, the reason being a dry joint off one set of pick-ups meaning that the loco was only picking up from one side and the tender. A quick dismantle and dab of the soldering iron has fixed that. The loco is now a really super runner - steady and smooth - perfect for an engine that will spend much of its time shunting 16 tonners around.